Ad impressions reached a record high during the fourth quarter of 2012, according to data from Opera’s latest State of Mobile Advertising report, with revenue to publishers more than twice that of any previous quarter throughout the year. The figures show that Android continues to increase its share of the market, but it’s got a long way to go before it topples iOS, which boasts a whopping 41.91% share. Opera’s mobile advertising platform serves more than 50 billion ad impressions every month, spread across 12,000 mobile sites and applications — so it’s a great snapshot at the state of the mobile market. The surge in fourth quarter traffic has been attributed to the holiday shopping season, which is a big boost for smartphone and tablet sales. Android claimed 30.94% of that share, accounting for 29.97% of ad revenue, according to Opera. Amazingly, the Samsung Galaxy S III accounts for a full 9% of that share. iOS still leads with a 41.91% share, which accounts for 51.02% of the revenue. Opera has broken the iOS share down into different devices. Unsurprisingly, the most popular iOS device, the iPhone, accounts for most of it with 29.08%, while the iPad accounts for just 5.82%. The iPod touch accounts for 7.01%, which doesn’t seem like much, until you compare it to the others in the chart. BlackBerry, then named RIM, claimed a 3.74% share of the market, accounting for 4.12% of the revenue. That means that the iPod touch — all by itself — provided more ad impressions than the entire lineup of BlackBerry smartphones. That’s incredible. 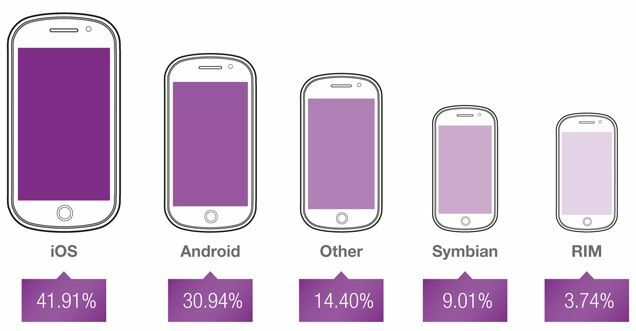 Even the dying Symbian platform gave more than BlackBerry did, with a 9.01% share. Music, video & media is the category that saw the largest share (21.4%) of mobile ad impressions, but arts & entertainment generates the most revenue (17.18%). 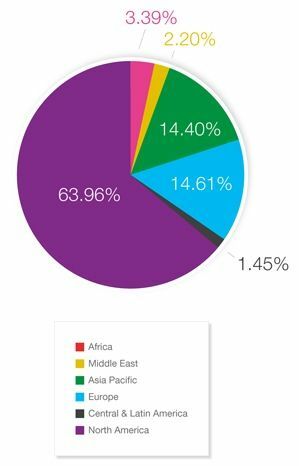 A full 63.69% of total ad impressions came from North America, while 14.61% came from Europe. Asia was in third with 14.40%.